This is one of Thailand's most impressive experiences, whether you are a nature lover or not. The Khao Sok National Park is located in Ban Ta Khun and the Phanom district of neighbouring Surat Thani province. The whole park covers 645 sq km. It is actually the heart of a complex of five contiguous conservation sites that comprise the largest protected forest on the Thai-Malaysian peninsula, covering over 4,000 sq km. The other sites are Sri Phang-Nga National Park, Khlong Panam National Park, Khlong Saen and Khlong Nakha. The park is very spectacular with dripping thick native verdant rainforest, punctuated by towering outcrops of limestone cliffs or karsts, waterfalls and sparkling streams, an island studded lake, several caves, and many trails, mostly along rivers. A beautiful large reservoir was created by the construction of the Cheow Lan Dam (also known as the Ratchaprapha Dam) across the Paseang river; this Cheow Lan Lake occupies some 165 sq km. The vast area of water is actually retained by several small dams and the surrounding rock formations are overgrown with lush jungle. Limestone outcrops protruding from the lake can reach heights of 960m, which is three times the height of similar famous formations in Ao Phang-Nga. The Park has a plethora of wildlife - leopard, Malaysian sun bear, Malaysian tapir, serow, wild Asian elephant, wild pig, numerous primates (dusky langurs, pig-tailed macaques, white-handed gibbons), and (literally) maybe half a dozen tigers. In total there are 48 mammal species. There are also approximately 38 species of bats roosting in the Park's many caves, such as the Tham Khang Khao (bat cave). The 180 bird species include eagles (such as the Lesser Fish-eagle and Wallace's hawk Eagle), hawks (such as the Bat hawk), and several species of hornbills, kingfishers and woodpeckers. 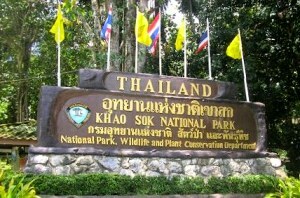 The Park is also filled with bamboo, lianas, ferns, palms (such as the rare Kerriodoxa elegans which only grows at Khao Sok and Ko Phuket), rattan (including the giant rattan with 10 cm diameter stems), and last but not least the wild lotus (the largest flower in the world, reaching 80 cm in diameter). The wild lotus (bua phut , also known as the Giant Rafflesia) is only found in Khao Sok and a nearby Park. Variations however do exist in Malaysia and Indonesia, and the species was originally discovered by Sir Stamford Raffles, the founder of Singapore, and his companion Dr. Joseph Arnold (ref. the variety rafflesia arnoldi ). Not only is it the largest flower in the world, it is also the heaviest weighing up to 7 kg. It is parasitic living as microscopic filaments in the roots of the liana jungle vine; it has no roots or green leaves; occasionally buds the size of footballs erupt, from October to December, and then bloom in January producing a tremendous stench, comparable to rotting flesh, which at least the carrion flies seem to enjoy and so effect pollination. Since the Park is located in the central mountain ridge twixt the east and west coats of peninsula Thailand, it receives quite a bit of rainfall from May to October as it is subject to monsoon rain from both the Gulf of Thailand and the Andaman Sea. The dry season is early November to April. Whilst the dry season has it's merits, you are more likely to see some of the larger mammals (civets, black bear, slow loris, boar, wild elephant and, if extremely lucky, tigers) along the trail system during the wet season. From Khao Lak proceed northerly on route No 4, some 35 km to Takua Pa, then, shortly thereafter, east on route 401 towards Surat Thani. 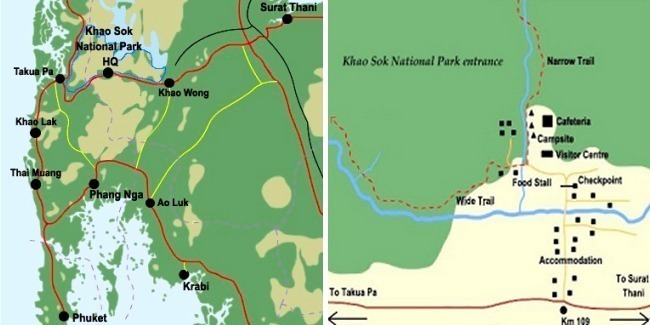 The park HQ is 50 km from Takua Pa (at distance marker 109 km; the markers decrease in the direction Takua Pa - Surat Thani). Public buses (some with air-con) serve the HQ. The dam is a further 60 km east. - forest walks and nature trails. - viewing wildlife, fauna and flora, rare and endangered species. - canoeing and tubing on meandering river through the jungle. - visit waterfalls; various trails lead to them. - one or two operators offer a small night safari. - Lake tours by longtail boat. The early morning mist is very tranquil & spectacular. Dusk tours reveal the swarming bats. Swim in the cool clear freshwater lake. named after a giant in Thai mythology. She died at Khao Sok of a broken heart when her adopted son ran away. The mountain outline resembles the position of a body laid to rest for funeral rites. Near the Park HQ there are camping and bungalow facilites. 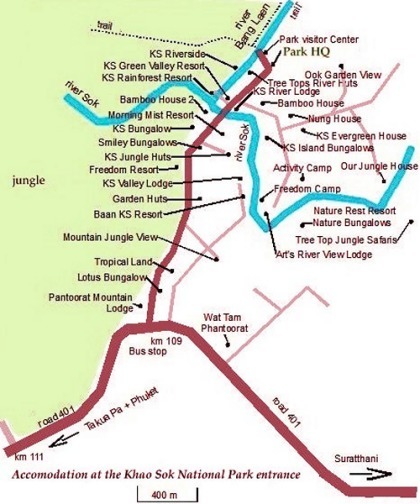 Also there are a few private sector tour and bungalow (mini resort) operations, some of which feature sturdy cottages on stilts and also tree-house style accomodation. There is a visitor centre with an exibition and self-guided maps and trails. Park Rangers lead jungle tours and rafting trips. Guided hikes can be arranged offering river-running, and visits to waterfalls and caves. The private sector will also offer a guide to accompany you. The Lake is some 60 km east of the Park HQ; turn left after distance marker 53 on route 401, then proceed a further 14km north west to substation No. 2. There are floating raft houses, with fairly good toilet and shower facilities, near the Dam at substation No. 3. And smaller raft houses, with communal facilities outside, are available at substation No. 4. Park Rangers offer one or two day tours of the Lake with overnight stay. Boats can be chartered (including those from local fishermen) to explore the caves, coves, wildlife and canels along the lake shoreline. Tour operators, and the resort hotels, in Khao Lak offer various tour itineries for one to four days, or even longer for really serious adventures. 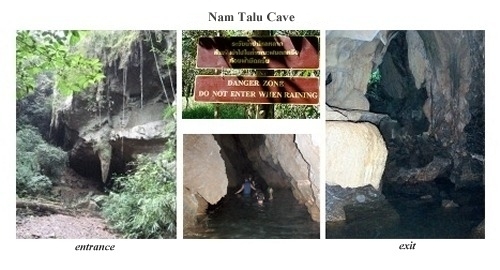 Please observe the warning signs about entering the caves during heavy downpours especially in the rainy season. Please report to Park wardens "before" entering the caves if the signs ask you to do this. Flash floods can occur, resulting in a torrent of water entering the caves and leaving people trapped. Wing Hin Waterfall at Khao Sok (2.8 km from Park HQ)) is a small but attractive waterfall joining the Sok River near Bang Hua Raed. Bang Hua Raet Waterfall at Khao Sok (3 km from HQ) is a large and beautiful waterfall. There are 2 levels of water flow coming from a Sok waterway. Mai Yai (grandmother) waterfall is 3km from HQ but is easy to access from the main road (Takua Pa - Surat Thani road) at km 113 marker. It is a single level 30 metre waterfall. Wang Yao at Khao Sok is a large and beautiful pool. It is local approximately 3 km from the park HQ. Bang Leiap Nam Waterfall at Khao Sok (4.5 km from HQ) is a small waterfall and comes from the Sok River near Bang Hua Raed. Than Sawan Waterfall at Khao Sok (6 km from HQ) is a beautiful waterfall along a tributary of the Sok River. The forest trail leading here is difficult and requires wading along the stream bed for the last kilometer. This is slippery and can be dangerous during the rainy season when the water current is quite strong. It is about 1 km walk downstream from Tang Nam. Tang Nam Waterfall at Khao Sok (6 km from HQ) is where the Sok River has formed a dramatic gorge through the rock and a deep pool. This huge pool provides an important habitat for many species of fish and aquatic life. Walk downstream from Wang Hin Waterfall to reach this beautiful spot. Ton Kloi Waterfall at Khao Sok (7 km from HQ) is a single level fall along the Sok River. It maintains a strong flow of water all year and the forest pool at its base is excellent for swimming. Ton Kloi waterfall can be visited in a day trip from the Park HQ. San Yang Roi at Khao Sok (2 km from HQ). The panoramic view of the mountain ridge is coated with a green blanket of tropical trees mostly being - San Yang Roi. Sip-et-Chan Waterfall at Khao Sok (4 km from HQ) is an 11 tiered waterfall along the Bang Laen River. The start of the trail is directly behind the park restaurant, up the set of steps. The forest tail takes you through tall bamboo forest, crosses the river six times and leads to the base of the falls. The accommodation that is within national parks are usually managed by the Department of National Parks (DNP). Private guesthouses are all outside the park. There is thus something like thirty accomodation abodes in the form of private bungalowss and tree houses. These abodes are grouped along the short road from route 401 to the Park HQ entrance. The Cheow Lan is a rock with fat clay core methodology used to construct the dam. This hydro electric dam on the Phra Saeng River was built in 1982 and the resulting reservoir (lake) covers an area of 185 square kilometers. The dam (rock) is 94 meters in height and 760 meters in length. As a result of the dam, a lot of pristine lowland forest area in the district was flooded. However this means that the remaining forest is mostly comprised of craggy limestone cliffs, mountainous terrain, and swift flowing streams. And so, as it turned out, a spectacular lake was created with scores of steep limestone cliffs and hills jutting out of the clear emerald water. The lake offers breathtaking views of limestone mountains and there are more than 200 small islands. The main entrance to the lake by road is at kilometer 53 marker on route 401. Thereafter proceed north west for a further 14 kilometers to the sub-station. 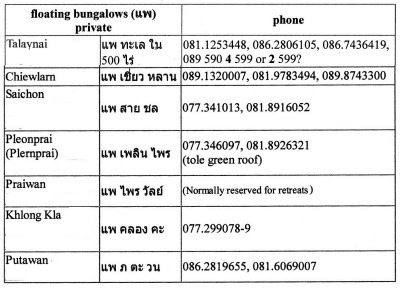 To make reservations for the Khao Sok park's bungalows and/or Cheow Lan Lake rafthouses contact the Khao Sok Park HQ directly. Bookings can also be made at the Royal Forest Department in Bangkok at +66 2 579 7223, +66 2 579 5734, +66 2 561 4292-3. Also contact TAT (Tourist Authority of Thailand) Region 5 at +66 77 288818-9 for more details on a complete list of accommodation at Khao Sok. There are also several tour companies which can arrange reservations, bookings and tours. 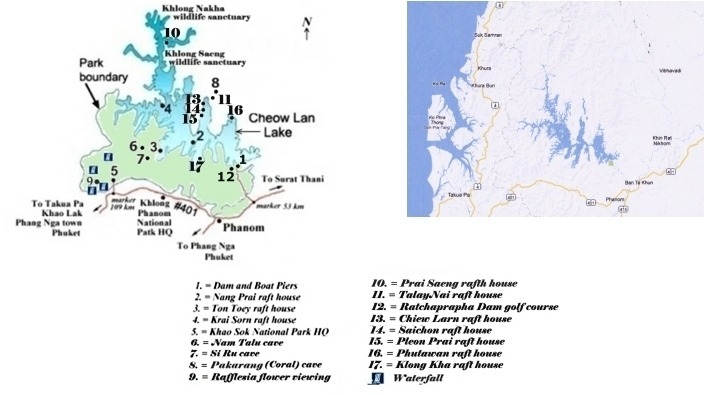 There are three main raft house sites ( Nang Prai, Ton Toey, Krai Sorn ) on the lake with varying standards of location, age, condition and facilities. The basic concept is that the huts are about 3 meters by 3.5 meters in size. They are very basic but include bedding, bed sheet, pillows and mosquito net. The roof is thatched. Usually there is a bamboo floating walkway to the toilets and shower rooms on the lake bank. Electricity is typically provided by a diesel engine from 6 to 10 pm, after which time guests have to use oil lamps provided by the station. There will be a restaurant serving Thai and some western foods. It is also possible to simply turn up at the dam and hire a boat for around B1800-2000. On overnight trips to the lake, accommodation is either in tents in the jungle or at raft houses on the lake. There are both private (eg. Sai Schon rafthouses, Jungle rafthouses) and national park raft houses moored at various scenic spots around the lake shore, mostly around an hour's boat ride from the dam. All raft house huts are rudimentary bamboo structures with nets and mattresses, offering fabulous lake views from your pillow. If you've arranged your own boat transport, you can fix accommodation at any of the lake's raft houses for B500 per person including three meals. Part of the appeal of a night in a raft house is the dawn safari the next morning, when you have a good chance of seeing langurs, macaques and gibbons on the lakeshore; some tours include this option, or you can usually borrow a kayak from your accommodation and paddle around the shore yourself. Tours generally combine a trip on the lake with a wade through the nearby flooded cave system and a night on a floating raft house. 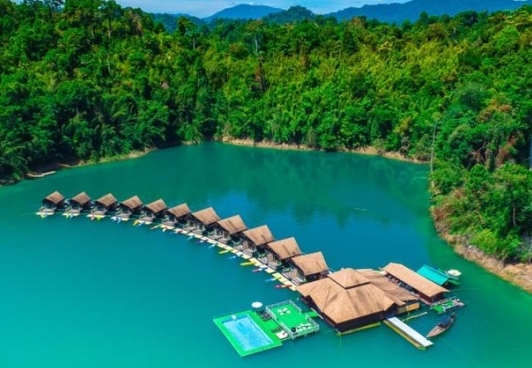 The lake is 65km from Khao Sok's accommodation area, and can only be explored by longtail boat tour, arranged either from Khao Sok or from Ratchabrapa Dam. Khao Sok National Park has several limestone caves including Tham Nam Talu, Tham Si Ru, and Bat cave (Tham Khang Khao). Caves are formed by underground water and are characteristic of limestone landscapes. These caves were formed through the chemical process of carbonation in which the calcium carbonate of the limestone is dissolved by water containing carbon dioxide. The rock is gradually eroded until a tunnel is created. Sometimes the process is reversed and calcium carbonate is deposited within the cave in the form of stalactites and stalagmites. For many people, the highlight of their lake excursion is the adventurous three-hour trek to and through the 500 metre long horseshoe-shaped Nam Talu cave, a five-minute boat ride from the national park raft houses of Ton Toey, or about an hour's boat ride from the dam. The trek is not for everyone or the faint hearted, however, as the cave section entails an hour-long wade through the river that hollowed out this tunnel. (So that is a 2 hour trek to the entrance of the cave, and then a 1 hour trek through the cave). The opening and the inside of the Nam Talu cave is huge at the beginning but after about thirty minutes it gets narrower and narrower. In many parts of the cave you have to wade in waist-high water with a fast current. (The narrow sections increase the speed of the water). In other parts you actually have to swim through ( 20 metre ) sections with huge and deep passages whilst holding on to a rope, in almost complete darkness. The water is quite cold. When the river level is high there will be longer swims. All in all, this is a wonderful and exciting experience - you just need to take it slowly and carefully in a couple of the tricky places. But you should Not enter the cave during rain. The best weather is from January to April. The rainy season is regarded as May to mid December. The exit from the cave is quite close to the lake. Use extreme caution in the rain, due to higher water levels and stronger currents and flash floods. There are signs warning against entry during rain. Wear shoes with decent grip and request (or take) your own torch. Park staff have recently installed alarms and a rainwater meter that will warn visitors of any danger from a flash flood. Bat cave (Tham Khang Khao) is a large chambered cave which is home to several bat species - the entrance to this cave is perched high on a cliff face. Si Ru cave has four converging passageways which meet in this cave. Ton Toey can also be reached by hiking 13 kilometers from the kilometer marker 99 on highway 401. Tourists must hike with a local guide. - include sturdy non-slip shoes, trekking shoes, comfortable clothes, outdoor gear in general, spare clothes, even some form of a plastic raincoat. - insect repellent, mosquito protection, sun protection. You may also encounter the odd leech. - note that mobile phone signals are very poor in the area. - the guides carry a first aid kit and are trained to know how to use it. It is advisable to bring a basic first aid kit (bandages, disinfectant, antiseptic, anti diarrhea, sunscreen) to treat minor injuries and prevent infection. Wear a lifejacket aboard boats, kayaks and canoes - all the time. Be careful on the lake because in case of an emergency, the nearest hospital is a half-day boat trip plus a 2 to 3 hour drive at least. The rangers (at the DNP government stations) are equipped with two-way radios, since there is almost no network for mobile phones. Note that there is very abundant rain from April to December. 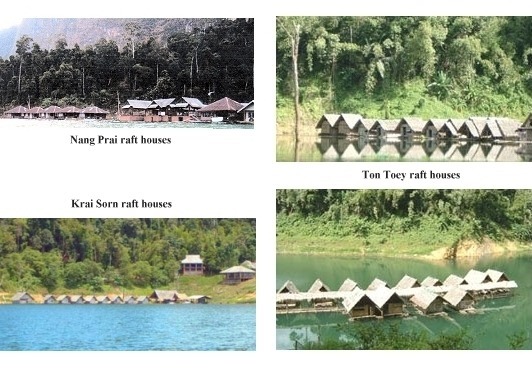 On the lake, the Department of National Parks (DNP) has installed floating bungalows at a few locations (stations), (with a restaurant, canoe rental, karaoke etc). These are basic bamboo huts, on bamboo rafts, for rent, with mosquito net, little or no electricity, and no running water). The booking is made directly with the DNP (email, fax, and payment to a bank), or via private agencies that sell trips. It also has some private concessions on the lake. Agencies charge their own rates on these private floating bungalows, which can sometimes include a commission. Big Toman (Giant Snakehead), Featherback, Rohu and Hampala Barb. The spawning season for the Thai Mahseer and the Hampala Barb is from May to October. The Thai Mahseer and Hampala Barb migrate from Cheow Lan Lake to the smaller streams and rivers to go upstream for spawning. The best time to go fly fishing for these fish is at the end of October. This is also one of the few places to see Giant Mekong Catfish in the wild in Thailand. Ratchaprapha Dam Golf course. There is a beautiful and testing 18 hole, 6000 yard golf course (par 72) close to the dam at Baan Takun. 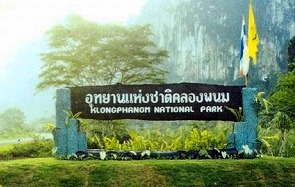 This Park is just across the road (route 401 ) from Khao Sok park, and the main HQ entrance is at kilometer 90 marker. It covers an area of about 450 square kilometers. The forest is the habitat of a variety of animals including elephants, deers, tapirs, bears, serows, wild pigs, gibbons, monkeys, langurs, squirrels, mouse deers, red jungle fowls, etc. 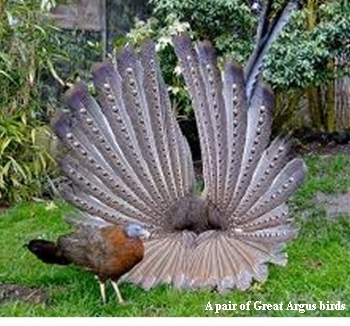 as well as variety of birds and reptiles. 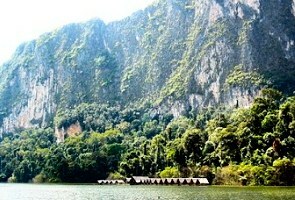 Klong Panom National Park has the same dramatic limestone architecture found at Khao Sok. There is very little publicity or development at this park, and thus the park could offer interesting adventures for real explorers.